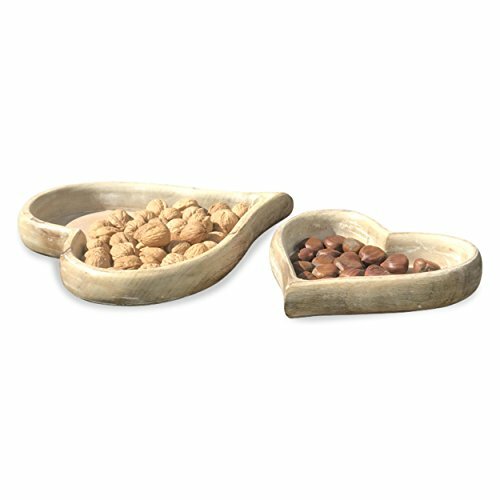 WELCOME YOUR GUESTS as you serve them fun appetizers or drinks on the Farmer's Market Heart Trays, Set of 2. Made with quality, these superb trays feature rounded rims that surround the beautifully grained wood, making them easy to carry. Amazing accent pieces loaded with country style charm, place them on an ottoman or coffee table to create an eye-catching focal point. CRAFTED BY HAND Inspired by one of the most universal symbols of love in the world, these heirloom quality mango wood trays have been carved by expert artisans. Finished with a layer of white wash that is then rubbed off, each tray has a weathered rustic finish that whispers age. WELL SIZED each tray in the set measures as follows: 1 - large 13 ¾ L x 14 ½ W x 2 H and 2 - 9 3/4 L x 9 3/4 W x 1 1/2 H inches. DESIGNED FOR DISPLAY when not entertaining, these trays are perfect to collect your trinkets and organize in many rooms of the house. Easy to care for, simply wipe clean with a damp cloth. AN IDEAL GIFT, it's perfect to celebrate holidays, birthdays, weddings and many more. So gorgeous, you'll want to keep it at home for yourself. Enjoy! By Whole House Worlds Welcome to the product line of Whole House Worlds. The New York based company offers high quality, stylish products for every room in the house, and beyond. From the kitchen, to the living room, to the bedroom, dining room, home office, closet and garden: Our criteria are comfort, quality, style and value. WELCOME YOUR GUESTS as you serve them fun appetizers or drinks on the Farmer's Market Heart Trays, Set of 2. Made with quality, these superb trays feature rounded rims that surround the beautifully grained wood, making them easy to carry. Amazing accent pieces loaded with country style charm, place them on an ottoman or coffee table to create an eye-catching focal point. CRAFTED BY HAND Inspired by one of the most universal symbols of love in the world, these heirloom quality mango wood trays have been carved by expert artisans. Finished with a layer of white wash that is then rubbed off, each tray has a weathered rustic finish that whispers age. WELL SIZED each tray in the set measures as follows: 1 - large 13 ¾ L x 14 ½ W x 2 H and 2 - 9 3/4 L x 9 3/4 W x 1 1/2 H inches. DESIGNED FOR DISPLAY when not entertaining, these trays are perfect to collect your trinkets and organize in many rooms of the house. Easy to care for, simply wipe clean with a damp cloth.